Coming into the family business can put a lot of pressure on anyone, but when your father is one of greatest fighters of all time, expectations can be extremely high. 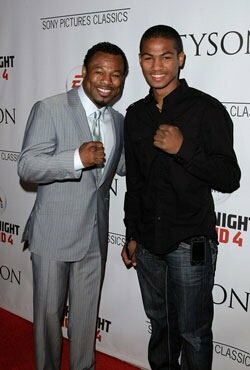 Sugar Shane Mosley won multipe world titles in three weight classes, and is a first ballot hall of famer when he becomes eligible. Bash Boxing’s Chris Strait sat down with Shane Mosley Jr. for 12 rounds of Q and A as Mosley prepares to make his professional boxing debut on Top Rank’s April 26th “Boxing at the Beach” show at the Oceanview Pavilion in Port Hueneme. Q: How do you feel to be making your pro debut? A: I feel great, excited and ready. Q: What was your amateur record? Q: What does having the Mosley name to carry on do for your career, or the pressure it puts on you? A: The pressure and notoriety comes with the territory, but I am prepared to do the best I can. Q: How does your style differ or compare from Shane Sr.? A: Well, the way I am different, is that I am taller and longer, so I have to fight a different style. The similarities are that I punch hard, and I am tough. Q: Your father won World Titles at lightweight, welterweight, and light middleweight. You are noticeably taller than your father. In which weight class will you begin your professional career? A: I am going to campaign at Middleweight. The bout on April 26th will probably be a about 162 pounds. Q: It used to be that being trained by your father wasn’t advisable in boxing, but now it seems to be the rule more than the exception. Have you had other trainers, and how is it working with your father? A: I have hit the mitts with other trainers, but I know my father has my best interest at heart, and he has experience at the top level. Like what Floyd Mayweather Jr. has with Roger. He is a family member and has that big fight experience… I have that with my dad. Also my father is critiquing me different than just as a coach. Q: Can you tell when he slips out of trainer mode, and into father mode? A: Oh yeah (laughs). Definitely. Q: Do you know who your opponent will be, and do you prefer to study them ahead of time, or just fight instinctively? A: Well, as an amateur, you have to take it as it comes. Your opponent will be whoever wins the next round, or whoever shows up. So, it doesn’t make a difference. I prepared to fight whoever. Q: What is your favorite part of training? Q: Who have you been sparring with? A: I have been working with a lot, but some are Paul Mendez, Kassim Ouma, Shibata Flores, and a lot of guys at Wild Card Gym and at Floyd’s gym in Vegas. Q: Do you have any specific goals in boxing? A: Just trying to be the best. Q: Where can fans follow you?